On Tuesday night Friends of Waterfront Seattle hosted an event with landscape architect James Corner, of High Line and Fresh Kills fame, on the continuing redesign of Seattle’s downtown waterfront. With replacement of the viaduct at a standstill and a new proposal for a hill-climbing gondola, the conversation is rapidly becoming more dynamic and exciting. The city should capitalize on this momentum to make its urban shoreline a world class attraction. Many parts of the downtown waterfront aren’t pleasant today. Waterfront Seattle is a major civic endeavor that is incorporating a number of other public projects. The Elliott Bay Seawall is being rebuilt to seismic standards, Colman Dock is being rehabilitated, Pike Place Market is extending, and the Seattle Aquarium is doubling in size. But the driving impetus is the demolition of the Alaskan Way Viaduct, an aging and seismically unstable concrete structure that carries six lanes of Highway 99. When the viaduct comes down a large expanse of the waterfront, most of it owned by the City of Seattle, will be open for new uses. Corner noted that Seattle is just one of many North American cities that are reinvesting in the public realm, an element often neglected in favor of transportation and commercialism until about 20 years ago. The goal is to create a vibrant, walkable, and pleasant urban park in a downtown that’s never had a major green or open space. Marshall Foster, City Planning Director, remarked, “We are becoming a big city”, with proximity to nature, a great arts scene, strong cultural institutions, and thriving businesses hubs. Corner noted the impacts of the High Line in New York City, a project of similar scale and grandeur, which has generated $2 billion in economic activity since its completion. Young people are more mobile in the past and can choose which large city they want to live in; bringing a superb waterfront experience to Seattle will give the city a competitive advantage. Corner explained that in the three years since being contracted for the project he has sensed a unique mix of qualities in the downtown area. Seattle’s is a working waterfront, with the port, ferries, pier-based activities, and variety of businesses. Pioneer Square’s historic buildings also influence the area’s character. Corner emphasized that the design should not to be too rich and have some grit reflected in the material choices, such as timber and brick. The waterfront will be for everyone, and indeed has been designed by everyone; Foster noted that dozens of stakeholder and public participation events have been well attended. More is to come, as the project is expected to be completed in 2019. The design primarily consists of a pedestrian promenade along the shoreline from CenturyLink Field at Railroad Way to Olympic Sculpture Park at Broad Street, a distance of about 1.75 miles or 24 blocks. There is a stunning variety of features planned along the way. At Washington Street there could be an artificial beach with a boat launch, and extending from that is a vacant pier that may be converted to event and amphitheater space. Elevators or escalators on Seneca and Union Streets will help pedestrians get up the hill to 1st Avenue. A plaza outside the Seattle Aquarium, with water and educational features, could host year-round festivals and holiday events. A shallow ramp up to Pike Place will provide scenic views, and a possible barge with swimming pools and hot tubs could be moored at another plaza-type pier. 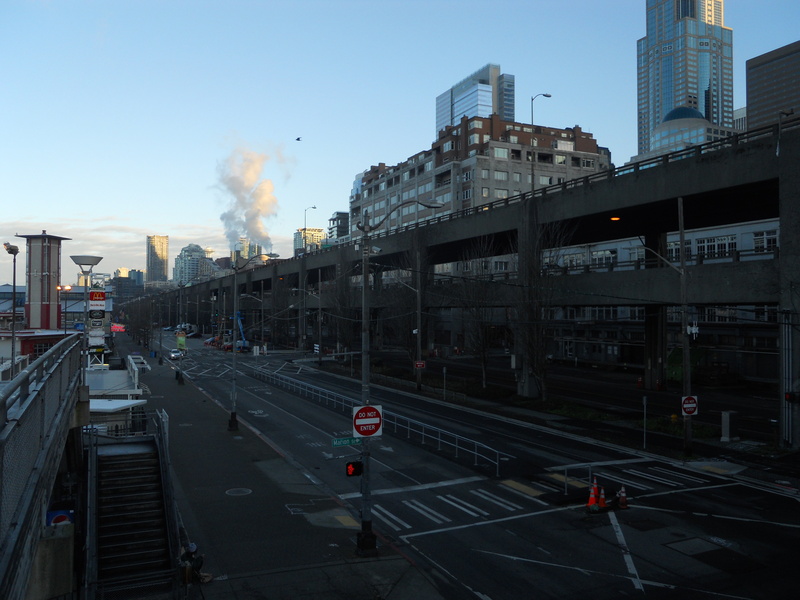 At Pike Street the plan is to split the promenade to the Sculpture Park and to a new park in Belltown. 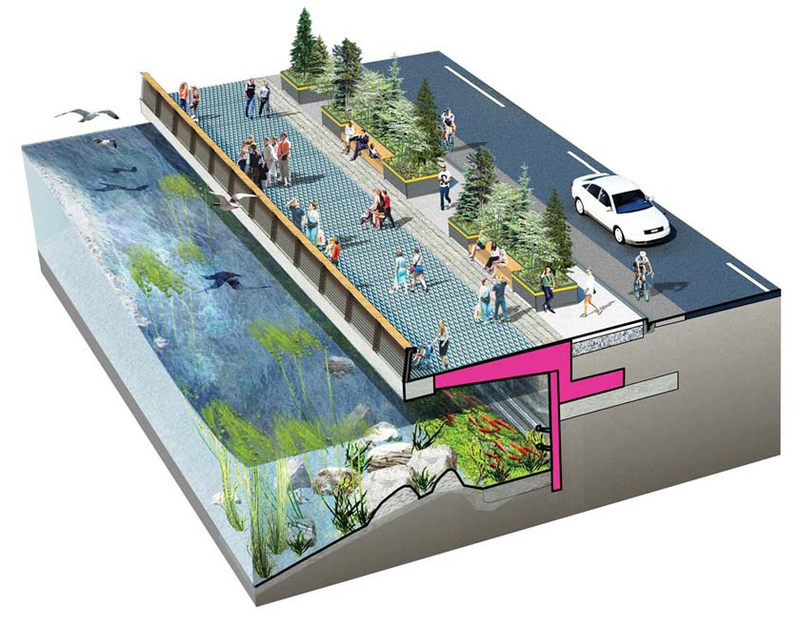 The whole route will be heavily vegetated with trees, planters, and tall grass, which will also form rain gardens for filtering stormwater, and a series of water features are also planned. Kiosks for food and souvenir vendors will be scattered throughout and a cycle track will run most of the length. On parts of the promenade that cantilever over Elliot Bay glass sidewalks will give passerby a view of aquatic creatures and habitat below. Despite Seattle’s reputation for wet weather there are few covered structures planned. Corner said this was a deliberate decision, as the mist, drizzle, and sprinkle is a defining trait of Seattle. Foster supported this by noting Seattle is an active city with joggers, cyclists, and athletes rain or shine. There will be some cover, though, under the canopies of larger trees and in the arcades of historic pier buildings. I previously criticized the waterfront plan for its retention of many traffic lanes on Alaskan Way, but Tuesday’s presentation somewhat alleviated that concern. Pedestrian crossings will exist and be prioritized at every intersection with bulb-outs, medians, and visually distinct crosswalks. In some places the promenade will be an impressive 100 feet wide compared to 20 feet currently. A closer look at the concept plan shows that most of the redesigned Alaskan Way will only have four traffic lanes and a lane of parking on each side for most blocks, which is somewhat reasonable but will still make the route a major arterial and bring traffic noise and fumes. And there are disconcerting six and seven lane segments envisioned between King and Columbia Streets, which is clearly intended to get hourly ferry traffic in and out more efficiently than the current layout around Colman Dock. One lane in each direction could be reserved for transit, whatever form that may be (8 MB PDF). The City is investigating a short streetcar or bus line along the entire project. One option is to reinstall the old Waterfront Streetcar that was dismantled a few years. In addition to meeting safety and accessibility standards, a modern streetcar would make sense because it could connect to the First Hill line terminus at Jackson Street and 1st Avenue, and eventually stretch north to Queen Anne and Ballard. In the near future another rehabilitation effort could improve the Pike-Pine corridor from Pike Place up to Capitol Hill. The Downtown Seattle Association is proposing a variety of streetscape improvements to make the area safer and more pedestrian friendly. The City supports this, but what is needed is dedicated private investment into more family-friendly spaces and retail activities. If something does happen within the next few years, new life and transportation improvements could nicely accommodate the new waterfront. Recent events pose challenges to the waterfront project. The Griffith family, who manages Seattle Great Wheel that opened in summer 2012, announced Monday their proposal to build a gondola from their Pier 57, over Union Street, and to the Washington State Convention Center with a single intermittent stop at Pike Place Market. The distance is only 10 blocks but sees about a 140 feet elevation change. The problem with this system is that it will reduce the street life and activity promised by the waterfront plan and hurt shops that depend on busy foot traffic. And as Seattle Transit Blog points out, this is a private system but would be operating in a public right-of-way, so if it does get built ownership should be transferred to the City. There is also the question of whether ORCA cards could be used for payment. There’s also Bertha, the broken tunnel boring machine under Pioneer Square. It’s stuck 48 feet underground due to a breached seal on its main bearing, and it will be at least nine months before it can restart its work on the replacement of Highway 99. A worrying possibility is this delay will put off the final demolition of the viaduct, which would also delay much of the waterfront construction, but Foster proclaimed that the City is committed to bringing down the viaduct on schedule in 2016. Funding has not been entirely secured for either construction or future maintenance. The estimated cost is $1.07 billion, with about 60 percent confirmed with a bond on the seawall and money from WSDOT. Along with general city funds, closing the gap will likely involve a Local Improvement District to assess a small property tax on surrounding landowners and a voter-approved Metropolitan Parks District. Friends of Waterfront Seattle, a non-profit, is aiming to build awareness of the project, solicit private donations for funding, and manage ongoing maintenance and programming once the park is complete. This type of project is needed to reap the great potential of Seattle’s unique urban shoreline. It’s long overdue, yet well timed with a mix of concurrent projects like the Pike Place and aquarium expansions, and will create a multiplying effect on the pedestrian and retail vibrancy of downtown. Improvement in this vital public realm will help Seattle both rise to a global status and improve the livelihoods of residents, tourists, and businesses alike. This entry was posted in Biking, Buses, Ferries, Government, Land Use, Landscape, Megaprojects, Parking, Parks, Public Art, Public Space, Rail, Roads, Sustainability, Transportation, Walking and tagged Alaskan Way, Bertha, Colman Dock, construction, cycle track, downtown, Elliot Bay, features, Field Operations, Friends of Waterfront Seattle, funding, gondola, High Line, Highway 99, James Corner, landscape, park, pedestrian, Pike Place, Pike-Pine, redesign, replacement, revitalize, Seattle, Seattle Aquarium, seawall, shoreline, streetcar, transit, tunnel, urban, viaduct, waterfront, Waterfront Seattle, Waterfront Streetcar, WSDOT. Bookmark the permalink.